Note: A guide that provides information at numbered posts along the trail is available at the beginning of the trail. Having one with you will make the hike more informative and enjoyable. 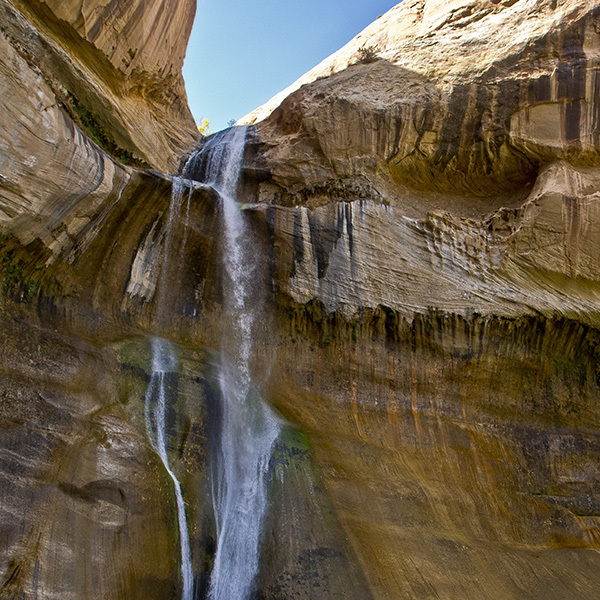 The trail begins at the Lower Calf Creek Falls sign just before the road dips down to cross the creek. 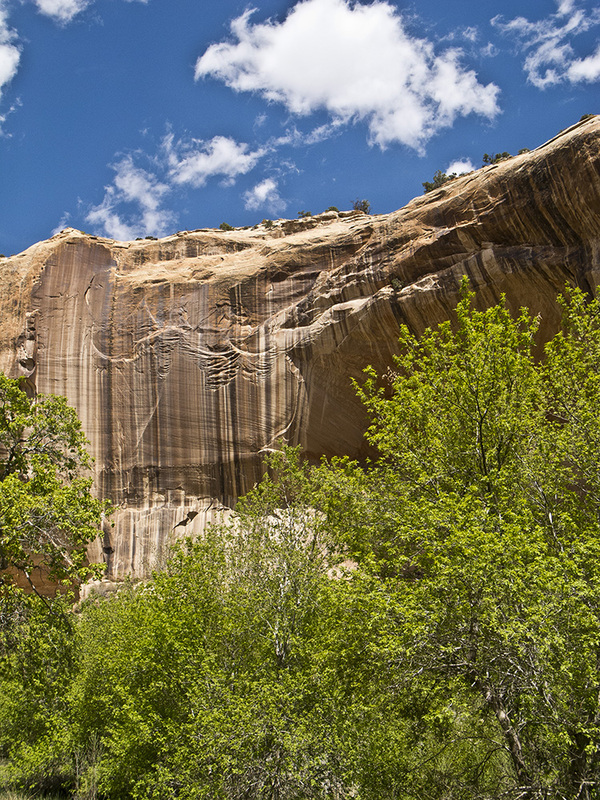 High on the east wall of the canyon, the highway to Boulder is carved out of the Navajo Sandstone, the dominant geological layer in the canyon. 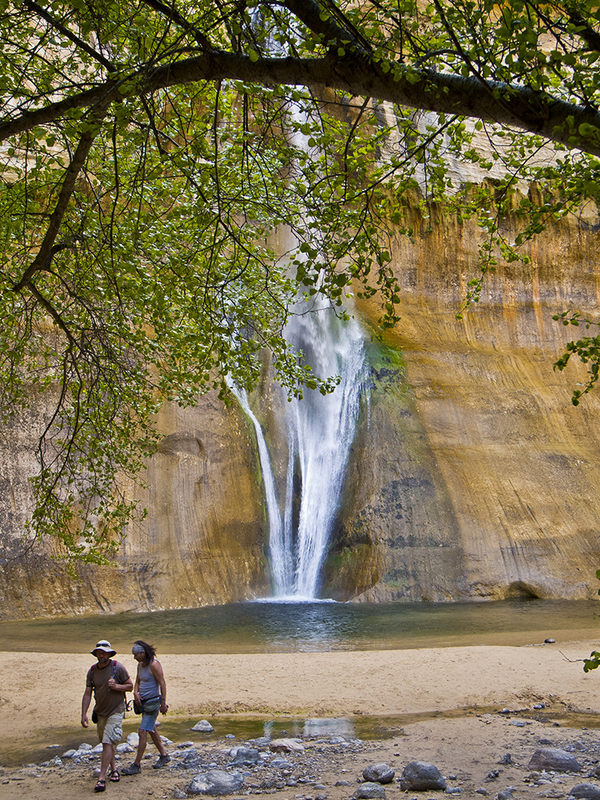 After crossing a sandy stretch, the trail goes up a side drainage, climbs out of it, and then drops down some sandstone ledges to within a few feet of the creek, where you can take a cool dip. Keep a sharp eye on the high ledges of the canyon’s east wall and see if you can spot a small granary before you reach signpost #5, which talks about it. At signpost #8, look across the canyon at the base of a smooth cliff face streaked with desert varnish. 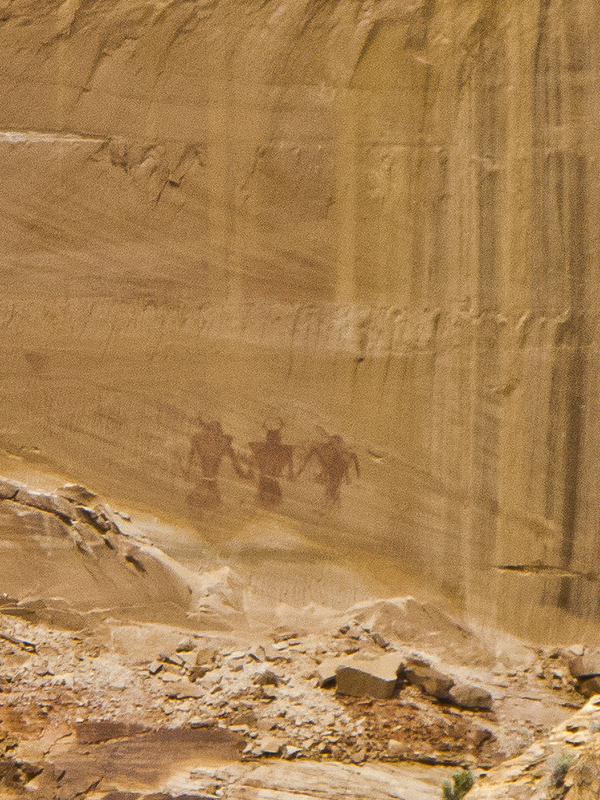 If you look closely (better yet through binoculars), you can see three human-like figures painted in red wearing headdresses and holding hands. These pictographs (which are painted, as compared to petroglyphs, which are pecked) were created by the Fremont people, who lived in this area from about 700 – 1300 AD. The pictographs are about two miles from the falls. Next, the trail climbs a hill. If you look down into the creek, you’ll see a beaver dam and lodge. The trail then heads for the bottom of the west wall, hooks right, and soon reaches a box canyon coming in from the left. You can see a small granary tucked into a ledge halfway up the wall on the right side of the canyon. Soon after (about 2 miles from the trailhead), the trail drops down to the creek bank. Is That a Waterfall I Hear? As the trail follows the clear stream, keep your eye open for small trout. They usually hang out downstream of small rocks and other objects that disrupt the flow so they don’t have to work so hard to stay in place. The canyon narrows considerably at this point, and in the afternoon the trail is shady and cool. After the trail crosses a small meadow, it arrives at the plunge pool where the falls pour down the streaked, moss-covered wall. There is a shaded, sandy beach that is an incredible spot to sit, relax, and enjoy one of the most special places on the Colorado Plateau. Return the way you came. 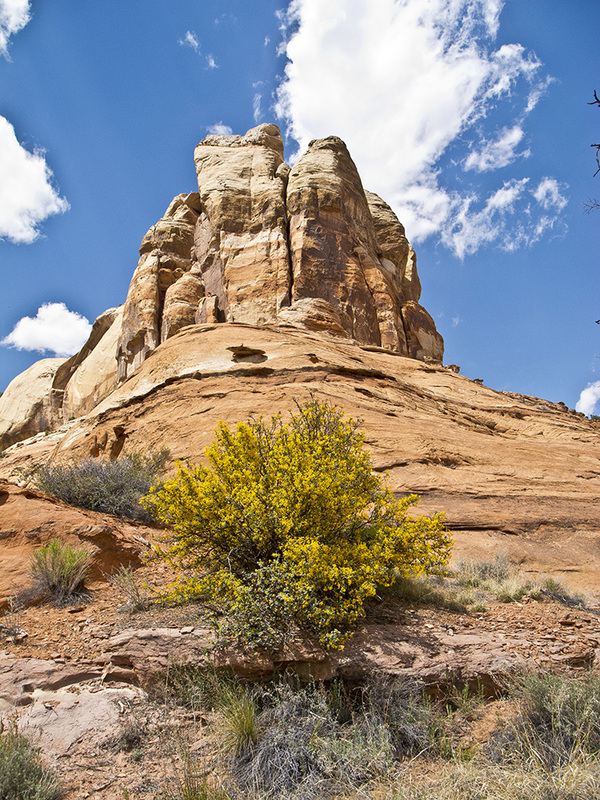 The trailhead is in the Calf Creek Recreation Area, which is on Utah State Highway 12, about 15 miles east of Escalante, UT, or 11 miles south of Boulder, UT. Drive in to the recreation area and park in the large parking lot. Pay the fee and walk up the paved road past a few campground sites for about 0.2 mile, where the trailhead sign is on the left side of the road just before it crosses the creek.